First there was the terrors plants. Then the exponential increase in reported snake sightings. And now, Great White Sharks. While the initial inclination might be to avoid the seashore sushi buffet for creatures that can exert a potential bite force of 18,21 newtons, it is relatively rare for white sharks to attack humans so close to the shore. Yet however rare, the frequency of shark bites as specified by Shark Spotters out of New Zealand has increased, with 2015 having the most unprovoked shark attacks ever recorded – 98 in total. What is the reason for this increase? Two reasons: People spend more time in the water and collecting data on the prevalence of shark attacks has improved greatly with the International Shark Attack File, maintained by the Florida Museum. North Carolina continues to be one of the premier locations for unprovoked shark attacks with 61 “bites” being recorded since 1935 – spread across eight counties. 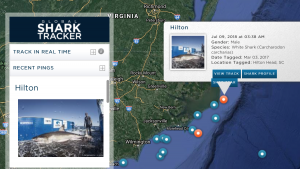 In the past thirty days there have been two Great White Sharks pinged off the coast; a male and female, one named Hilton and the other named Savannah. The male weighing in at around 1,300 pounds. Another eight have also been tracked and pinged this year in the vicinity of Virginia and North Carolina. Fear not though, experts in shark migration have said this is the time of the year when the giant fishes relocate north to give birth to their pups – not scouring the coastal regions looking to make short work of unsuspecting tourists.